A beta for upcoming real-time strategy game Dawn of War II – Retribution will launch "in the new year", Relic's announced. The game is the first in the series to use Valve's Steamworks networking and matchmaking to provide cooperative and competitive online play. 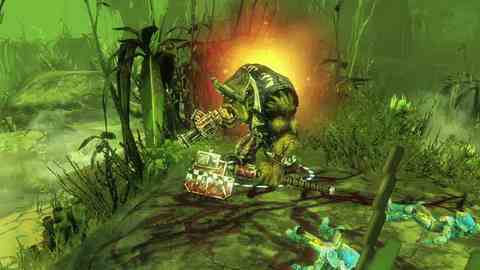 Dawn of War II and expansion Chaos Rising use Games for Windows Live. "This new back end will allow players to invite friends into matches from their Steam friends lists, and take advantage of the full set of Steam community features including groups, achievements, and Steam overlay chat channels," Relic said. "We are also going to include an all new matchmaking and ranking set up, built specifically for Dawn of War II – Retribution. "The move to Steamworks will also allow us to provide features like guest passes, free multiplayer weekends, pre-loading and the ability to provide fast turn-around on future patches and updates." DOWII and CR will continue to use GFWL "in order to preserve the owners of those titles ability to earn Live achievements as well as their established friends lists", Relic added. But in a change from Relic's strategy with previous expansions, the developer will not patch new units for each of the existing five races back into DOWII and Chaos Rising. "More details on the beta will be announced at a later date," Relic promised. THQ core boss Danny Bilson told Eurogamer last month that the decision to switch from GFWL to Steamworks for its titles was a difficult one. "We've done a lot of research here," he said. "Microsoft is a fantastic partner of ours. For us to make a decision to go to Steamworks over them required a real deep dive on the part of some of our team."